A crystal is a solid whose particles are arranged in an orderly, repeating, geometric pattern. Crystals come in all sizes and shapes. 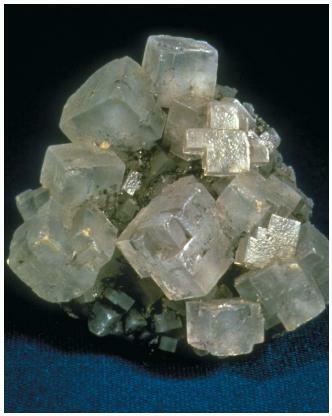 Regular table salt, for instance, consists of tiny cubic particles called salt crystals. The crystal shapes that we can see with our naked eye reflect a similar geometric pattern that exists at the level of atoms. For example, the substance we call salt is actually a chemical compound called sodium chloride. Sodium chloride is made of sodium ions and chloride ions. Each sodium ion is a tiny particle carrying a single positive electric charge. Each chloride ion is a tiny particle carrying a single negative charge. A crystal of table salt consists of trillions and trillions of sodium ions and chloride ions. The way in which these ions arrange themselves in a salt crystal depends on two factors: the size of each ion and the electric charge on each ion. Recall that similar (or like) electric charges repel each other, and unlike charges attract each other. That fact means that all of the sodium ions tend to repel each other. They will get as far from each other as possible in a salt crystal. The same is true of the chloride ions. On the other hand, positively charged sodium ions will be attracted by negatively charged chloride ions. Sodium ions and chloride ions will try to get as close to each other as possible. Obviously some kind of compromise position has to be found that allows these forces of attraction and repulsion to be balanced against each other. Size can make a difference, too. Chloride ions are much larger than sodium ions, and this affects the shape of salt crystals. The final compromise that best satisfies charge and size factors in sodium chloride is a cube. One sodium ion occurs at each of the alternate corners of the cube. One chloride ion occurs at the other alternate corners of the cube. In this arrangement, sodium ions and chloride ions are held together by forces of electrical attraction, but ions of the same kind are kept as far from each other as possible. The basic shape that satisfies charge and size factors is known as a unit cell. Thus, for sodium chloride, the unit cell is a cube. Other geometric arrangements are also possible. For example, the problem of balancing electric charges for a crystal of calcium chloride is different than it is for sodium chloride. The calcium ions in calcium chloride each have a positive electric charge of two units. A different geometric arrangement is necessary to accommodate doubly charged calcium ions and singly charged chloride ions. a rectangular box whose end is a square. In an orthorhombic crystal system, ions are arranged at the corners of a rectangular box whose end is a rectangle. Lattice: A collection of unit cells that are all identical. Unit cell: The simplest three-dimensional structure of which a crystal is made. 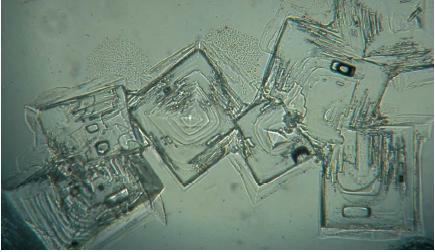 If you could look at a crystal of table salt with a microscope you would see a vast system of unit cells. That system is known as a crystal lattice. As shown in the photo of salt (on p. 602), a crystal lattice is simply many unit cells—all exactly alike—joined to each other. For this reason, the crystal shape that you can actually see for a crystal of table salt reflects exactly what the unit cell for sodium chloride looks like. Professor Gordon Miller of Iowa State University is seeking permission to include the images on this page in his classroom course packet. Professor Miller teaches Chemistry 201, Advanced General Chemistry, of about 48 students. Could you please tell me who to contact to get permission to reprint this. Thank you! Good Afternoon! Professor Gordon Miller of Iowa State University is seeking permission to include the image on the webpage with Rock Salt Crystals in his classroom coursepacket for the Chemistry 201 course he will instruct in the Fall 2011 semester. This class will have about 54 students. If you could tell me who to contsctfor permission to reprint this? Thank you!